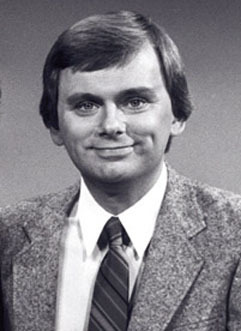 In high school, Pat Sajak's name was drawn at random in a radio station's contest, making him "guest disk jockey" for a night. He liked it, and took broadcasting-related courses at Columbia College in Chicago, where he landed a job reading news off the wire on a local radio station. In the Army, he was sent to Vietnam, where his served as a morning disc jockey on Armed Forces Radio. When Sajak left the Army, he worked as disc jockey when he could, and as a hotel desk clerk when he couldn't. He jumped from radio to TV with the NBC affiliate in Nashville, where he did station breaks, commercials, and was promoted to weatherman. Sajak looked good on camera and pronounced words like "cumulus" properly, and soon he was the weatherman at KNBC, the NBC-owned station in Los Angeles. In 1981, Chuck Woolery, host of Wheel of Fortune, demanded a bigger raise than Merv Griffin was willing to give. Griffin turned on the TV, saw Sajak predicting sunshine and smog, and offered Sajak the show. In 1989, CBS handed Sajak a late-night talk show, hoping to compete with Johnny Carson's Tonight. The Pat Sajak Show lasted a year and a half. It's most memorable moment came toward the end, when Sajak wasn't there: Rush Limbaugh guest-hosted and infuriated the studio audience so much that the auditorium was empty before Limbaugh could finish the show. In 2003, Pat Sajak Weekend began on Fox News, with Sajak interviewing celebrities. It was axed after one season. He's also talked baseball on the weekly internet Pat Sajak Baseball Hour, and his PAT Productions makes kiddie videos like Leo the Late Bloomer. Hollywood Walk of Fame 6200 Hollywood Blvd.